Yesterday we enjoyed an evening with dinner and music at the Beach House in Marbella. This luxurious beachfront hotel, located between Marbella and Puerto Banús, has 2 luxurious pools and 5 restaurants. Surrounded by lush gardens with direct beach access, it provides complimentary green fees at Marbella Club Golf Resort. 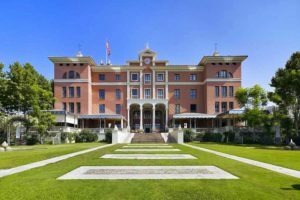 Featuring bedrooms with a private terrace and sea or garden views, the Marbella Club Hotel was originally the private residence of Prince Alfonso von Hohenlohe, the founder of the hotel. The property has 5 restaurants, serving international and traditional Spanish cuisine. Puerto Banús features a wide range of designer shops, bars, and restaurants. The hotel provides a shuttle service to Marbella Club Golf Resort, where guests can golf for free. The 18-hole golf course was designed by Dave Thomas and offers views of the Mediterranean Sea and Africa. The property also features a Thalassa Spa with sea views, offering a range of treatments, including a sauna and a water bed. This spacious complex also includes a Kids’ Club for children. It has a dance studio, music room, an enchanted forest, as well as many other recreational and educational facilities. This property also has one of the top-rated locations in Marbella! 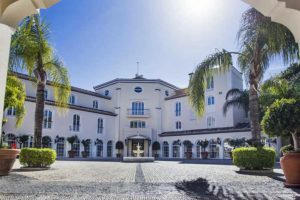 Featuring three 18-hole golf courses, this luxury hotel is a 10-minute drive from Puerto Banus. Designed like a Tuscan palace, it features a 21,500-ft² spa, Roman Amphitheater and a luxurious beach club. Villa Padierna Palace Hotel offers rooms and villas surrounded by beautiful gardens. All have views of the golf course, pool or gardens, and in some cases the Mediterranean Sea. Air-conditioned rooms and villas have satellite TV, a CD player and luxury Fretted bed linens. Private bathrooms include a bathtub and shower, hairdryer, slippers and bathrobe. All villas have private grounds, and some have a private swimming pool. Villas also feature a kitchenette. The Thermal Spa includes an indoor pool and gym. There are 2 saunas, 3 steam rooms and a Turkish bath. A range of health and beauty treatments is available in The Medical Wellness Institute. The hotel has 4 restaurants, with outdoor terraces offering superb views. There is also an English bar with a fireplace. The hotel offers a free shuttle service to its summer beach club, where there is a restaurant. Lounge chairs and beach towels are provided. Healthouse Las Dunas Adults Only is a luxury health-focused hotel located in Estepona. Set in a traditional Andalusian-style building, this adult only property offers two health and wellness Spa Centers, and various pools. All air-conditioned rooms in this hotel have a modern flat-screen TV with satellite channels, safe, sofa, working area and minibar, plus a private balcony with an outdoor sitting area. The private bathroom includes free luxury toiletries, bathrobe and slippers, bath and shower. Set within luxurious gardens and fountains, the property offers medical experts in dieting and nutrition, meeting facilities, and different classes, including Yoga, Pilates, and Aqua gym. Free WIFI is available in the entire property. Healthouse Las Dunas Adults Only offers 2 Wellness and beauty Spas of 320 square meters and 3,000 square meters, guests can enjoy a wide range of treatments focused in weight reduction, relaxation or beauty. Specialized in health and wellness, this hotel offers a balanced and healthy diet and does not serve alcohol or soft drinks, only natural juice, water, tea and coffee. Infusions and alcohol-free cocktails are also provided. Smoking is forbidden throughout the entire property. Healthouse Las Dunas Adults Only is located a 15-minute drive from Puerto Banus, and 70 km from Malaga Airport. Showcasing a spa center and sauna, The Oasis by Don Carlos Resort is located in the Elviria neighborhood in Marbella, just 11.3 km from Bus Station. The hotel has a fitness center and hammam, and guests can enjoy a meal at the restaurant or a drink at the bar. A flat-screen TV with satellite channels, as well as an iPod docking station and a CD player are provided. Certain rooms include a sitting area for your convenience. You will find a kettle in the room. For your comfort, you will find free toiletries and a hairdryer. You will find a 24-hour front desk, hairdresser’s, and gift shop. The hotel also provides car rental. The nearest airport is Malaga Airport, 32.2 km from Oasis Don Carlos Resort. Showcasing a year-round outdoor pool, playground and sun terrace, Gran Meliá Don Pepe is located in Marbella. Guests can enjoy the on-site bar. Free WIFI is available throughout the property and private parking is available on site. Certain units have a private bathroom with a spa tub, and others have bathrobes and slippers. Some rooms include a sitting area where you can relax. A terrace or balcony are featured in certain rooms. For your comfort, you will find free toiletries and a hairdryer. A flat-screen TV with satellite channels is provided. There is a 24-hour front desk at the property. You can play ping-pong at this hotel, and bike rental and car rental are available. The nearest airport is Malaga Airport, 40.2 km from the property. This property is directly on the beach. 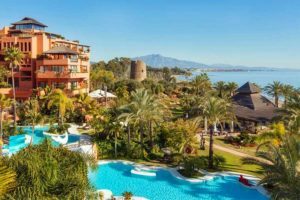 Showcasing a year-round outdoor pool and terrace, Kempinski Hotel Bahía Beach Resort & Spa is located in Estepona in the region of Andalusia, just 22.5 km from Marbella. The hotel has a spa center and sauna, and guests can enjoy a drink at the bar. Free WIFI is provided throughout the property and private parking is available on site. Every room at this hotel is air conditioned and is fitted with a flat-screen TV with satellite channels. Certain units feature a sitting area where you can relax. Certain rooms include views of the sea or garden. Every room is equipped with a private bathroom with a bathtub and bidet, with bathrobes provided. For your comfort, you will find slippers and free toiletries. There is a 24-hour front desk and hairdressers at the property. You can play tennis and ping-pong at this hotel, and bike rental and car rental are available. Ronda is 33.8 km from Kempinski Hotel Bahía Beach Spa, and Fuengirola is 45.1 km from the property. The nearest airport is Malaga Airport, 61.2 km from the property. This property is a 4-minute walk from the beach. Located between Marbella and Puerto Banus, Puente Romano Marbella is situated in front of the beach and offers tennis courts, several swimming pools, and a wellness center. Puente Romano Marbella offers a 2-star Michelin restaurant by Spanish chef Dani Garcia, seafront bar, pool bar and beach restaurant. There are Italian and Japanese restaurants, a Spanish Brasserie, organic restaurant, Nikkei and Thai restaurants and a gluten free deli. There is also a chill-out area and disco. All air-conditioned rooms have a private terrace with views of the sea or the gardens, satellite TV, iPod docking station, and free WIFI. One green fee per person per stay is included, for use at Marbella Club Golf Resort. There are free hammocks on the beach and around the pool. The tennis club has a sauna, Turkish bath, and offers free fitness activities. Activities such as yoga and Pilates are also available, as well as a kid’s club. Located at the beach club and overlooking the Mediterranean Sea, the spa has a large variety of treatments in its 9 treatment rooms with views of the sea, a hammam, wet area, steam bath, and sauna. There is a 24-hour reception and a car hire service. Free parking is available. 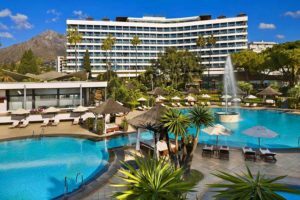 Located in Marbella, 9.7 km from Bus Station, The Westin La Quinta Golf Resort & Spa features a restaurant, bar and free WIFI throughout the property. The hotel has an outdoor pool and fitness center, and guests can enjoy a meal at the restaurant. Private parking is available on site. Each room at this hotel is air conditioned and features a flat-screen TV. There is a coffee machine and a kettle in the room. For your comfort, you will find bathrobes, slippers and free toiletries. You will find free shuttle service at the property. The hotel also provides car rental. The nearest airport is Malaga Airport, 48.3 km from the property. Showcasing a playground and views of the sea, Vincci Selección Estrella del Mar is located in the Elviria neighborhood in Marbella. The hotel has a sun terrace and views of the garden, and guests can enjoy a meal at the restaurant or a drink at the bar. Free WIFI is featured throughout the property and private parking is available on site. Every room has a flat-screen TV with satellite channels. The rooms include a private bathroom. For your comfort, you will find bathrobes, slippers and free toiletries. There is a 24-hour front desk at the property. The hotel also provides bike rental. Malaga Airport is 33.8 km away. This property is a 4-minute walk from the beach. Boasting a private beach area, Nobu Hotel Marbella – Adults Only is set in Marbella. Each accommodation at the 5-star hotel has views to the resort’s Plaza square, and guests can enjoy access to an outdoor swimming, a fitness center and La Suite night club. Plaza de los Naranjos is reachable within 3.6 km and the nearest beach is 500 m away. All guest rooms in the hotel are equipped with a flat-screen TV. Every room has a private bathroom, and a terrace with views to the resort’s la Plaza square, a leisure area with several restaurants and bars. All units come with a seating area. A buffet breakfast can be enjoyed in the breakfast area of the Nobu Restaurant. The signature in-house restaurant specializes in Japanese-Peruvian cuisine. Non-stop guidance is available at the reception with the possibility to pre-arrival check-in. Plaza de toros Marbella is 4.4 km from Nobu Hotel Marbella – Adults Only, while Puerto Banus is 3.3 km from the property. The nearest airport is Malaga Airport, 43 km from the hotel. The Best Marbella Events Directory !